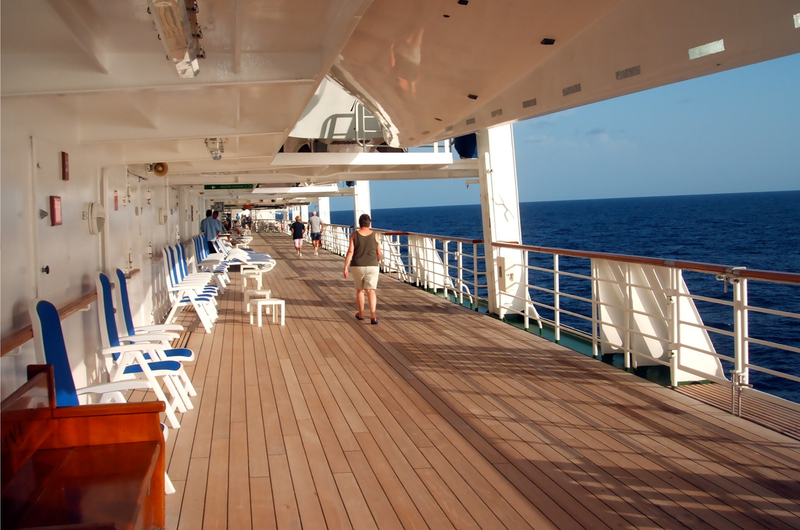 The old-fashioned promenade deck is making a comeback – and not before time. In the days before every cabin had a balcony and every ship resembled a block of flats, the centre of life on board was the promenade deck. Encircling the whole vessel, it was a place for leaning on the rail, gazing dreamily out to sea. In the mornings one might be fortified by a steaming mug of beef tea. Once the sun was over the yardarm, a stiff gin and tonic or a schooner of sherry was the order of the day. The promenade was the place to lounge on a teak steamer chair, possibly cocooned in a tartan rug as protection from the Atlantic chill. Rosy cheeks were the desired look, rather than an all-over tan, and before jogging became the rage, competitive couples would pit their skills at deck quoits or shuffleboard, playing for pride rather than prizes. Then came those balconies. First to the posher suites and then, on many ships, to every single cabin (sorry, stateroom). Each passenger got their own piece of perfect privacy, even if it was little bigger than a postage stamp, and the promenade deck went into steep decline. Some ships reduced it to a single strip of deck, the views and the sunbathing opportunities limited by the lifeboats suspended overhead. Others did away with it almost completely. Royal Caribbean even brought it indoors. There’s no doubt that the soaring space of the Royal Promenade on, say, Independence of the Seas is an impressive facility, lined with shops, bars and restaurants, and an all-weather venue for parties and street parades. But it also has the air of a suburban shopping mall: step through one of the exits and you feel you might be on your way to the multi-storey car park. The tide is beginning to turn, however. The clever folk who design ships, and their paymasters, have realised that most people cruise in order to be close to the sea, not cut off from it. P&O have announced that their new ship, arriving in 2020, will be girdled by an old-fashioned walkway. But you don’t have to wait that long. Promenade decks are already back – and while the modern version may be surfaced in non-slip plastic rather than authentic teak, it’s packed with al fresco dining and drinking venues (as well as making the perfect running track to burn all those calories off again). So if you’re the kind of cruiser who likes the tang of salt spray, turn the page for our top ten ways to be beside the sea in 2017/18. Here’s a ship that’s all about space. A mere 1,000 passengers roam about on a vessel that, in another operator’s hands, would probably carry twice as many. And Serenity has a Promenade Deck like no other (with the possible exception of Crystal Symphony’s). Broad, sweeping acres of immaculately maintained teak – yes, real teak – are uncluttered by lifeboats, steamer chairs, sun-loungers… or anything. If you can tear yourself away from your private balcony, it’s the perfect place to listen to Louis Armstrong singing What A Wonderful World as the ship pulls out of port (oh yeah!). It’s also popular as the venue for Crystal’s exclusive fitness programmes, either wearing weighted Walkvests, or carrying rubber-tipped Nordic walking poles. Norwegian Cruise Line was among the pioneers of the return to the promenade deck, though here it has a new name – The Waterfront. With Cellars wine bar, La Cucina Italian restaurant, Cagney’s steakhouse, Moderno churrascaria, Bayamo restaurant, and the 5 o’clock Somewhere bar all providing tables outside, there’s no shortage of enticing options for wining and dining. But although the deck encircles the stern, it doesn’t extend all the way forward, so joggers must take a short-cut through the ship – past Food Republic and the District Brew House bar. Do not stop; do not collect 2,000 calories. Another ship that uses its promenade deck as a restaurant and bar venue, Vista’s Bonsai Sushi and Fahrenheit 555 steakhouse are particularly popular, and the deck outside Ocean Plaza is just the place to relax with a morning coffee. However, you can’t complete the full circuit because the aft Havana cabanas have private balconies, complete with hammocks and sunloungers, and the Havana pool and bubble baths at the stern are reserved for suite guests during daylight hours. Joggers must content themselves with pounding the Deck 12 running track. If your idea of a proper promenade deck is all steamer chairs and tartan rugs, then QM2 will not disappoint. Nooks and crannies provide shelter (just what you need on windy days in mid-Atlantic) and it’s also possible to lie in the shade rather than scorch in full sun. The lifeboats suspended overhead add a suitably nostalgic feel – just be careful not to get dripped on if they have been used as tender boats earlier in the day. Seaside promises to lead the way for a new generation of cruise ships, with her christening ceremony planned to take place in the US this December. “The ship that follows the sun” will have a broad walk-round deck, dropping down a level to a sizeable pool area at the stern. The bars and restaurants it will adjoin have yet to be named, but they are sure to become the most popular venues on the ship. With not so much a promenade deck as an Olympic-sized running track, Harmony earns her place – at least for now – as the undisputed champion for length. The upper sun decks are for lounging, the indoor Royal Promenade is for shopping and eating. Deck 5, handy for the ship’s gym, is for serious calorie-burners (unlike sisters Oasis and Allure, Harmony has deck space set aside for exercise equipment). High up on the Lido Deck and the Sun Deck is the unique Sea Walk, a curving glass-floored corridor 60 feet long and 128 feet above the waves – great fun, unless you happen to be occupying one of the suites immediately below. The Sun Deck is also the venue for Movies Under The Stars, complete with popcorn and hot chocolate, and there are numerous complimentary fitness classes by the pool. OK, we admit it, this isn’t a promenade deck, at least not in the conventional sense. But the Disney twins make our list because of something even more exciting. The AquaDuck water coaster is a 765ft long tube that snakes its way around the ship and through one of its two funnels. With powerful water jets to propel riders in two-person dinghies up the ups, down the downs and eventually into a lazy river at the end of the plunge, it’s quite unlike anything else you’ll find at sea. Splashtastic! Holland America has gone back to the future in a big way. The 87,000 ton Nieuw Amsterdam boasts upper and lower promenade decks, but it’s all to a serious purpose. As elsewhere in the HAL fleet, the space is used each cruise for a charity fund-raising event, On Deck For A Cause. Guests are invited to donate $20 as they complete a 5km walk, and they can choose from cancer charities around the world, including Cancer Research UK, to receive the benefit. Depending on the ship, it can take from nine to 12 laps to clock up the distance. 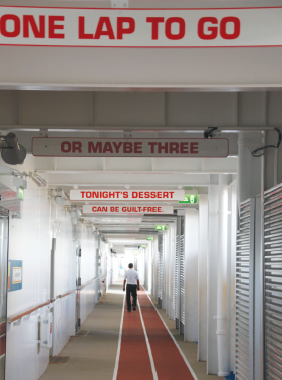 Count on P&O Cruises to provide a proper promenade deck. To complement Oriana’s elegant, multi-tiered stern, her promenade wraps around the ship’s theatre, Anderson’s bar and the Lord’s Tavern. Traditionalists will be delighted to find that it’s well equipped with deckchairs and loungers, plus the obligatory games and pastimes. Anyone for deck quoits?